Ok, I admit it. I just got back from my local Safeway with a plastic grocery bag full of bread – on sale for $1.30 a loaf – who could buy only one! – and a disposable starbucks cup full of dark roast goodness. I did this despite all my good intentions and having literally dozens of reusable grocery bags kicking around and a half dozen reusable coffee cups. You probably do too… so what gives? It gets worse. I had just watched the whole Nature is Speaking series – Kevin Spacey’s is above, in case you missed it ↑ and still I forgot to be responsible, to be environmentally conscious, to make purposeful choices… I was in fact, the opposite of responsible. I was functionally unconscious, pre-occupied, and mindless and in that state, habit became the driver. I let habits – or lack of good habits – derail me… and I probably pissed off nature and Mr. Spacey to boot. I know this stuff.. the habit stuff. I’ve taught it for years. Beliefs, thoughts, behaviours, change and habits were and still are the foundation of almost everything I teach or design curriculum around. This is all deep learning stuff and I know about that stuff… right? Clearly I don’t grok it as much as I think I do. Time to hit the mental reset button and form some better, purpose driven, and responsible habits. By the way – we say replace a habit with a habit because many habits form to fill a need or want. I have the habit of drinking coffee in the morning because I want to be be more awake and alert than I am naturally. The “want” probably won’t go away, but I could replace the habit of drinking coffee with a healthier habit, that helped me feel awake and alert. Easy – I am in the habit of leaving the house without cloth bags and reusable coffee cups. Also easy – Take the bags and cup with me. Easy? Not so much. It sounds easy. It looks easy enough. Sure is easy to talk and write about. It’s the doing it; the actual making-the-change-stick part, that seems to be the problem. To understand how to replace habits, or to change any behaviour, it helps to have a a basic understanding of how change works. 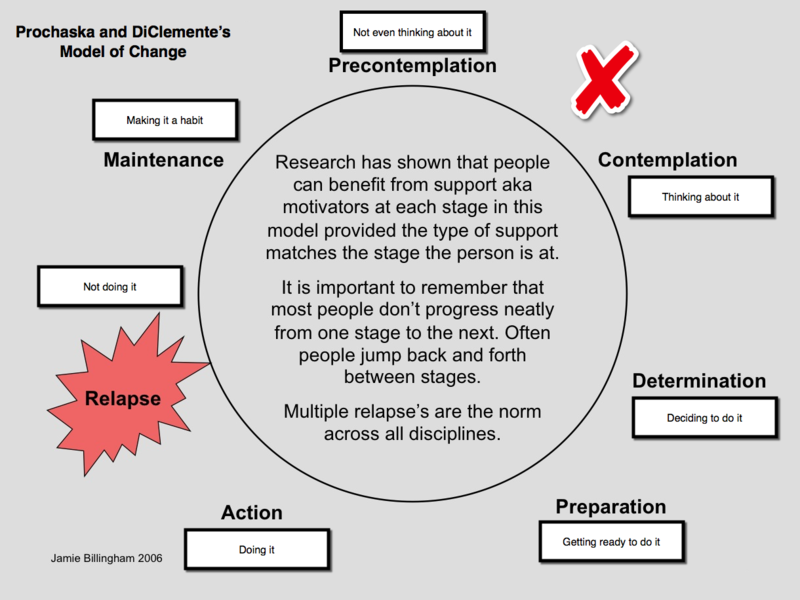 I default to the transtheoretical model of behaviour change because it’s well researched and makes sense to me. Although this model is used mostly in behavioural health – diet, exercise, substance abuse and recovery – its really a model of how most of us experience change in all areas of our lives. One of the critical parts of this model is the big X between precontemplation and contemplation. For most of us, most of the time, something has to happen for us to begin to think about changing a behaviour, especially a behaviour that has become a habit. That thing is a motivator. Motivation is driven by two things – carrots and sticks. A good thing or a not so good thing. The avoidance of pain or the desire for pleasure. Fear and love. The red X in the model above could be a good thing happening or a not so good thing and yes, sometimes its just a slow and gradual realization and the X is a thought. Pain and pleasure, real or imagined, that’s what gets us humans moving. Actually it’s what gets all species moving. The ability to experience pain and pleasure is not uniquely human however delaying gratification and enduring pain due to reason, is a human thing. Humans can rationalize and make choices based on our beliefs and thoughts. Well, most of us can anyways. To put it another way, animals don’t train themselves, humans can. The pleasure or reward bundle. Motivation is a bit more complicated than just carrots and sticks. 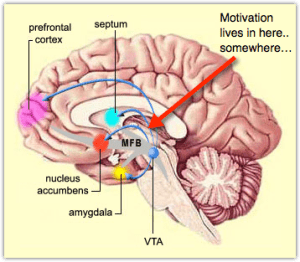 There is a host of biology, psychology and chemistry that affects motivation but in most cases and for most people, it comes down to avoiding pain and seeking pleasure. What each person perceives as painful or pleasurable can vary immensely. For example, the very thought of having to sing in public is excruciatingly painful for me. I would rather have a root canal. That feeling motivates me to avoid all Karaoke night invitations. In fact if you invite me to sing I will not have to think about responding, I will habitually and reflexively say “NO, thanks”. I’m Canadian, so saying “thanks” is a habit too. Ok, so what do we do about habits we want to replace? How do we translate what we know about change and motivation into a plan that will work? Here’s a couple of things that work. 1. Repetition. Remember that old adage about practice making perfect. Well, thats not quite right. Practice – repeating something over and over, makes it permanent, not necessarily perfect. Repetition makes things permanent and makes things easier. Just like running stairs at bootcamp. At first you think you are going to die and three weeks later you realize you won’t die, you’ll just… ok, never mind. You get the point. 2. Reminders. Placing something in the environment that cues or reminds you that you have decided to do something differently. In my case this could include putting the cloth bags and coffee cups on the front seat of the car or right beside my wallet. That way I’d see them before I left the house. 2. Making it easier to do it than not do it. This works really well for some things. For example if you want to replace the habit of eating chips in the evening and have decided to eat carrots instead, you could make sure there were no chips in the house and keep fresh carrots, ready to eat, at the front of the fridge. 3. Build in rewards for doing the new thing. Starbucks gives me 10 cents off my coffee if I use my own cup but that hasn’t been enough of a reward to keep me motivated. That’s the challenge with rewards – they have to be perceived as valuable by the receiver. Oddly, rewards don’t have to be overly consistent. Game theory has proved that inconsistent rewards are more effective in getting people to repeat behaviours. That’s why gambling is such big business and why it’s such a problem. Here’s an idea. Safeway and Starbucks share a location (in some areas). Why not help motivate people to use their eco-friendly bags and mugs by adding a game element. Give me Karma Points or Enviro-Points each time I use a re-usable coffee cup at Starbucks or a cloth bag at Safeway. Better yet, extend it to multiple stores and include some kind of chance at a tangible reward. For example, if I collected over X number of Points I could trade them in for a chance to win an ecotour. Even cooler, assign them a value and let me give them to store staff that are especially helpful, or to a local charity. 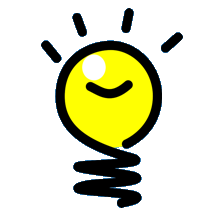 Giving lights up the pleasure centers in our brain… weird, eh. 4. Make not doing the new thing, painful. Ok, this is harder but there are some ways to do this without devolving into behaviours like snapping your own wrist with a rubber band – who comes up with this stuff? One thing that some of us could and would do – you know who you are – would be to use a Tweet of Shame. This is something that is uncomfortable enough to motivate but not so uncomfortable that folks would lie about it to avoid genuine embarrassment. I’m going to commit to this, out loud, right here and on social media, in a few minutes. That’s #5 btw. Committing out loud keeps you accountable, as long as the commitment and consequence are both realistic. I commit to admitting, on Twitter, when I relapse and don’t use cloth bags and/or a reusable coffee mug. What are you going to do to not piss off nature? ‘Cos, seriously, I can’t make air and I bet you can’t either.